Now that summer has arrived, my niece has launched into her sampler with a little more concentrated effort. I haven’t seen her latest stitching endeavors yet, though. Hopefully, next week I’ll be able to catch up with her on that. She told me she plans to listen to audio books (she’s a great fan of Agatha Christie) and stitch away. Sounds like an ideal summer plan to me! After I told you I was bidding farewell to this project for a time, I discovered that I could slip the whole project into a nice basket and keep it more or less available, regardless of other work to do. It’s much easier to take this project out and put a few stitches in when I have a few minutes than it is to go out to the studio, where I’m working on the ecclesiastical piece! So I’ve kept this thing next to the sofa in the living room, and have managed a few sessions on it here and there, as time allowed. I’ve managed to put in almost three whole bocks up there on the right. Each of these little blocks is less than an inch square, but in each of those little squares, there are 729 little stitches, so they actually take a while to do. 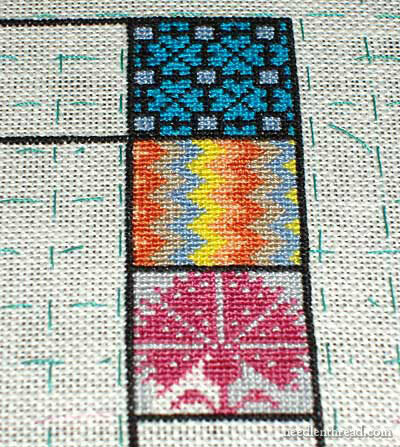 The sampler is pretty colorful, and no two motifs are the same, which is nice. While the actual stitching may get a bit repetitive, the changes in pattern and color make the piece interesting to stitch. It’s kind of fun, filling in those little blank squares with color and shape. There’s no stress at all involved in this kind of stitching, so it really does make a good, relaxing summer project! This is perhaps the oddest square I’ve stitched so far. 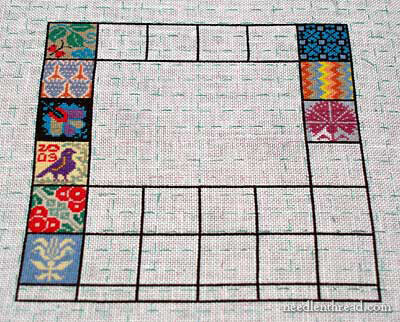 It doesn’t seem to fit the style of the other squares, and the colors are quite bright and almost garish. At first, I didn’t like it. I didn’t like the zig-zag pattern or the color arrangement. But what’s strange is that, just as I was coming to the end of this square, I found I did actually like it, somehow. I liked the way it filled in so tightly, and how all the colors formed their little own zig-zaggedly neat little rows. Overall, I wouldn’t call it “me-ish,” but I like it! This top half of the grey and pink square is perhaps one of my favorite elements so far. 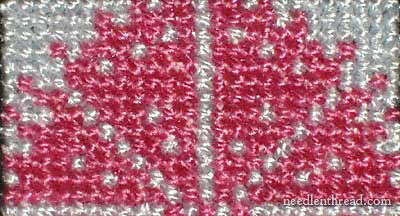 I like that “carnation” look, typical to 17th century petit point slips and other historical embroideries. I’m glad we undertook the project. It’s given me a better appreciation for counted techniques. And I still do intend to carry the whole project through to then end, which, for me, is a good sign that I’m enjoying it. I haven’t stitched on this for a couple weeks now, but I am still keeping it next to the sofa, awaiting the next 15 minute break that I can devote to it! Now, this is the thing: two weeks from yesterday, the embroidery piece I (finally) got set up the other day is due. I bet you know what that means! It’s the only thing I’ll be stitching on now. I must get it done! I have so many other projects, too, that I want to start! I’m also going out of town in two weeks – before I go, I want to set up several “on-the-go” embroidery projects that I can work on while I travel. So, keep your fingers crossed for me, that I actually do get something accomplished! THANKS! If you haven’t signed up for the Trish Burr Embroidery Kit Give-away I posted yesterday, do take a minute to read the post and add your comment! We both seem to have several projects going all the time. The great difference is, you actually get back to them more often and a lot quicker than I do. Your "project finished list" would put mine to a crying shame as well. I'm so curious Mary, do you just enjoy working on a variety or is it something that breaks the monotany of viewing just one piece for so long or is it more like my reasoning. As soon as I start a piece I'm already thinking of the next and just can't seem to resist my urges and before ya' know it I'm getting it ready for that first stitch? I really wish your pictures could click to enlarge so I could really get in there and see every little detail. But then I might stay on your blog all the live long day. As always thanks so much for sharing. Dragonfly is absolutly right saying that it is possible to spend all the day in this blog (or maybe it is impossible not to spend). There are so many interesting things. Your sampler is going very nice, I like following its progress. Some motives of it could become great cards. I love the bird on the left and blue ornament on the right the most. Bus I guess next time you will show some other great motives. 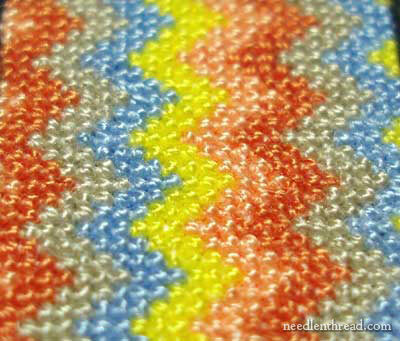 729 stitches in an inch square!! I am impressed. You do great work. Oh my. Talk about dedication! The thought of 729 stitches to an inch makes me cross-eyed. Yikes!! What is the thread count of the cloth? Is this sampler being used for the purpose of learning, since you said that your neice is learning embroidery. It is a good way to practice tiny stitching, isn't it? The piece looks beautiful. Your sampler looks so beautiful. 729 stitches must involve a lot of painstaking effort. Mary, I found your website just a few days ago, as I was looking for information on thread painting! I had been on Nordic Needle looking at thread painting books, authored by Trish Burr! I am an avid counted cross stitcher, who loves stitching historical samplers. I have been wanting to learn a new technique. As a child, I did surface embroidery, like so many other of us did as children. I have done some crewel, needlepoint and really want to learn needle painting. If I were to win Trish Burr’s needle painting kit, what would I do with it? Since almost everything I stitch, I give away, I would definitely keep it and frame it! I am so glad I found your site! I enjoy going there each day to see what you are talking about that day! Keep up the good work and I’ll pray that you finish your ecclesiastical piece in time! Previous Previous post: I’m Giving Away a Trish Burr Embroidery Kit!